With the retirement of Adam Gilchrist, not only Australia but also the whole cricketing world has lost one of the greatest entertainers of the game. Arguably, he would be the best wicket keeper batsman world has ever seen. Well, he is one of my favorites, and really going to miss him. Here I got something about this great player and want to share with you. So, just check it out. 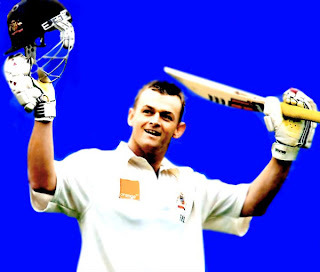 Adam Gilchrist entered the international cricketing scene as a wicket keeper/batsman with the Australian One Day International side against South Africa on 25th October 1996 in Faridabad. He was bowled by Alan Donald for 18, then effected his first dismissal by catching Hansie Cronje off Paul Reiffel for a duck. South Africa won the match by 2 wickets. In 1998, Steve Waugh elevated Adam to the pivotal position of opening batsman. In his second game, Adam scored 100 against South Africa and since then, has played a significant part in redefining the role of an opening batsman in One Day Internationals. Adam was crucial in the team's winning performance in the 1999 and 2003 World Cups. Adam has taken a world record of over 400 dismissals in one day internationals and scored over 8600 runs at a phenomenal strike rate of almost 97 runs per 100 balls faced. On 5th-9th November 1999, Adam replaced Ian Healy as wicketkeeper in the Australian test side in Brisbane against Pakistan. He was immediately into stride, taking his first dismissal by catching Mohammad Wasim off Damien Fleming for 18. Adam then scored 81 before being bowled by Shoaib Akhtar. Since that time, Adam has taken almost 370 dismissals in test matches and scored almost 5300 runs at an incredible strike of over 82 runs per 100 balls faced. Adam reached the 100 and 200 dismissal milestones faster than any other wicket keeper in test history and he is one of only two players to had averaged greater than 60 going through 3000 test runs. Adam is the only wicketkeeper in Australia to have captained the Australian Test and One Day teams and is acknowledged for his leadership and outstanding contribution to the Australian team in both forms of the game. Many critics believe that Adam is the greatest wicketkeeper/batsman to have played the game. But more than his statistics, it is the manner and spirit in which Adam plays the game that makes him one of the world's most exciting and popular cricketers. He already holds the record for the most sixes hit in Test cricket (97) and plays Test cricket in much the same way as he plays One-Day Internationals. In 2004 Adam was selected in Richie Benaud's All Time Greatest Team. He joined Sir Donald Bradman, Dennis Lillee and Shane Warne who were also chosen in this illustrious team. Adam said that he was humbled to be chosen in the team in front of so many other outstanding players and by a person who himself is acknowledged as one of the finest to have played the game. The only Australian wicketkeeper to have captained his country in both Test and One-Day International cricket. The fastest Test wicketkeeper to 100 test dismissals ( v England, Headingley 2001). The fastest Test wicketkeeper to 200 test dismissals ( v Zimbabwe, Sydney 2003). At the date of his retirement, held world record for the most dismissals in Test cricket - 416 dismissals. (Since surpassed by Mark Boucher of South Africa). At the date of his retirement, was world record holder for the most number of wicketkeeping dismissals in One-Day International cricket(472). World record-holder for the most dismissals in an innings in One-Day International cricket. Fastest strike rate in the history of One-Day International cricket for a batsman scoring over 5,000 runs. 16 One-Day International centuries scored at an average of 96 balls faced. Highest score in any World Cup Cricket Final - 149 on 28th April 2007 in West Indies. Fastest century in World Cup Cricket Finals matches. "Best of the Best": In 2007, voted by 39% of the 168 players to have represented Australia in One-Day Internationals as the greatest ODI player to have ever represented Australia. No other player polled more than 19%. Fastest strike rate in the history of Test cricket for a batsman scoring over 5,000 runs. 17 Test centuries scored at an average of 108 balls faced. Second fastest Test century ever recorded (57 balls - second to Viv Richards; 56 balls) but fastest by an Australian in Test cricket. Also scored several other quick centuries (e.g. 84 balls - v India, Mumbai 2001 and v Zimbabwe 2003). One of only three batsman in the history of Test cricket to average over 60 through 3000 test runs. First batsman in Test cricket history to hit 100 sixes. World record holder for a wicketkeeper for playing consecutive Tests without ever being dropped for form or injury - 96 after the fourth Test against India in Adelaide, January 2008.